Bread is a food item made of wheat. Three pieces of wheat are required to craft bread. 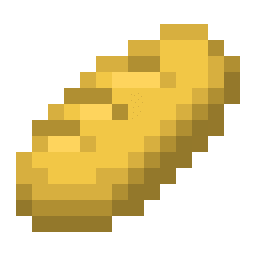 Bread heals 2.5 food points. It is a fairly easy to make and sustainable source of food. It is not often made on the first day, due to wheat taking a long time to grow. Bread isn't a rare food item. This page was last edited on 24 December 2018, at 12:54.